Whenever rsyslog receives a message, it passes this message to the preprocessor and then places it into the main message queue. Messages wait there to be dequeued and passed to the rule processor. The rule processor is a parsing and filtering engine. Here, the rules defined in /etc/rsyslog.conf are applied. Based on these rules, the rule processor evaluates which actions are to be performed. Each action has its own action queue. Messages are passed through this queue to the respective action processor which creates the final output. Note that at this point, several actions can run simultaneously on one message. For this purpose, a message is duplicated and passed to multiple action processors. Only one queue per action is possible. Depending on configuration, the messages can be sent right to the action processor without action queuing. This is the behavior of direct queues (see below). In case the output action fails, the action processor notifies the action queue, which then takes an unprocessed element back and after some time interval, the action is attempted again. Apart from this, queues can be configured with several directives to provide optimal performance for your system. These configuration options are covered in the following sections. If an output plug-in is unable to deliver a message, it is stored in the preceding message queue. If the queue fills, the inputs block until it is no longer full. This will prevent new messages from being logged via the blocked queue. In the absence of separate action queues this can have severe consequences, such as preventing SSH logging, which in turn can prevent SSH access. Therefore it is advised to use dedicated action queues for outputs which are forwarded over a network or to a database. Replace queue_type with one of direct, linkedlist or fixedarray (which are in-memory queues), or disk. The default setting for a main message queue is the FixedArray queue with a limit of 10,000 messages. Action queues are by default set as Direct queues. Replace object with main_queue, action or ruleset to use this option to the main message queue, an action queue or for the ruleset respectively. With direct queue, messages are passed directly and immediately from the producer to the consumer. This sets a name prefix for the file followed by a 7-digit number starting at one and incremented for each file. Disk queues are written in parts, with a default size 1 MB. Specify size to use a different value. FixedArray queue — the default mode for the main message queue, with a limit of 10,000 elements. This type of queue uses a fixed, pre-allocated array that holds pointers to queue elements. Due to these pointers, even if the queue is empty a certain amount of memory is consumed. However, FixedArray offers the best run time performance and is optimal when you expect a relatively low number of queued messages and high performance. LinkedList queue — here, all structures are dynamically allocated in a linked list, thus the memory is allocated only when needed. LinkedList queues handle occasional message bursts very well. In general, use LinkedList queues when in doubt. Compared to FixedArray, it consumes less memory and lowers the processing overhead. Replace object with main_queue, action or ruleset to use this option to the main message queue, an action queue or for the ruleset respectively. Both disk and in-memory queues have their advantages and rsyslog lets you combine them in disk-assisted in-memory queues. To do so, configure a normal in-memory queue and then add the queue.filename=”file_name” directive to its block to define a file name for disk assistance. This queue then becomes disk-assisted, which means it couples an in-memory queue with a disk queue to work in tandem. The disk queue is activated if the in-memory queue is full or needs to persist after shutdown. With a disk-assisted queue, you can set both disk-specific and in-memory specific configuration parameters. This type of queue is probably the most commonly used, it is especially useful for potentially long-running and unreliable actions. Replace object with main_queue, action or ruleset to use this option to the main message queue, an action queue or for the ruleset respectively. Replace number with a number of enqueued messages. When an in-memory queue reaches the number defined by the high watermark, it starts writing messages to disk and continues until the in-memory queue size drops to the number defined with the low watermark. Correctly set watermarks minimize unnecessary disk writes, but also leave memory space for message bursts since writing to disk files is rather lengthy. Therefore, the high watermark must be lower than the whole queue capacity set with queue.size. The difference between the high watermark and the overall queue size is a spare memory buffer reserved for message bursts. On the other hand, setting the high watermark too low will turn on disk assistance unnecessarily often. Rsyslog is often used to maintain a centralized logging system, where log messages are forwarded to a server over the network. To avoid message loss when the server is not available, it is advisable to configure an action queue for the forwarding action. This way, messages that failed to be sent are stored locally until the server is reachable again. Note that such queues are not configurable for connections using the UDP protocol. the last line forwards all received messages to the logging server using reliable TCP delivery, port specification is optional. With the above configuration, rsyslog keeps messages in memory if the remote server is not reachable. A file on disk is created only if rsyslog runs out of the configured memory queue space or needs to shut down, which benefits the system performance. Rsyslog runs as the syslogd daemon and is managed by SELinux. Therefore all files to which rsyslog is required to write to, must have the appropriate SELinux file context. The subdirectories will be created with the same SELinux context as the parent directory. This setting will remain in effect until the next WorkDirectory directive is encountered while parsing the configuration files. All types of queues can be further configured to match your requirements. 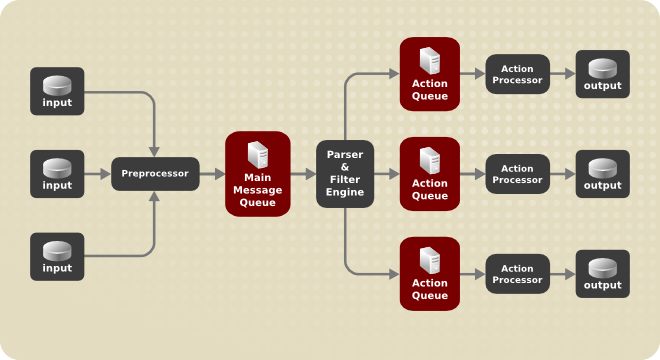 You can use several directives to modify both action queues and the main message queue. Currently, there are more than 20 queue parameters available, see the section called “Online Documentation”. Some of these settings are used commonly, others, such as worker thread management, provide closer control over the queue behavior and are reserved for advanced users. With advanced settings, you can optimize rsyslog's performance, schedule queuing, or modify the behavior of a queue on system shutdown. Replace object with main_queue, action or ruleset to use this option to the main message queue, an action queue or for the ruleset respectively. Replace number with a number of enqueued messages. You can set the queue size only as the number of messages, not as their actual memory size. The default queue size is 10,000 messages for the main message queue and ruleset queues, and 1000 for action queues. Replace object with main_queue, action or ruleset. When the size limit specified by number is hit, messages are discarded until sufficient amount of space is freed by dequeued messages. Replace number with one of the following numbers for respective priorities: 7 (debug), 6 (info), 5 (notice), 4 (warning), 3 (err), 2 (crit), 1 (alert), or 0 (emerg). With this setting, both newly incoming and already queued messages with lower than defined priority are erased from the queue immediately after the discard mark is reached. With hour you can specify hours that bound your time frame. Use the 24-hour format without minutes. Replace time with the duration set in milliseconds. Specifies time without new messages after which the worker thread will be closed. Default setting is one minute. Replace number with the maximum number of messages that can be dequeued at once. Note that a higher setting combined with a higher number of permitted working threads results in greater memory consumption. If set, all queue elements are saved to disk before rsyslog terminates. Replace action_type with the name of the module that is to perform the action and replace queue_size with a maximum number of messages the queue can contain. For queue_type, choose disk or select from one of the in-memory queues: direct, linkedlist or fixedarray. For file_name specify only a file name, not a path. Note that if creating a new directory to hold log files, the SELinux context must be set. See Section 22.4.2, “Creating a New Directory for rsyslog Log Files” for an example. The following example is based on the procedure Procedure 22.1, “Forwarding To a Single Server” in order to show the difference between the traditional sysntax and the rsyslog 7 syntax. The omfwd plug-in is used to provide forwarding over UDP or TCP. The default is UDP. As the plug-in is built in it does not have to be loaded. the last line forwards all received messages to the logging server, port specification is optional.